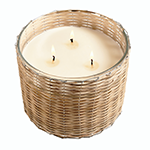 Hillhouse Naturals Grapefruit Persimmon Handwoven 2 Wick candle is more than just a simple citrus candle. This edgy and complex blend of grapefruit, persimmon and sweet bergamot will please citrus lovers as well as those looking for something totally unique. Part of the Hillhouse FIELD+FLEUR Grapefruit Persimmon Collection.